#VarunDhawan is in a happy place in his life right now. The actor is winning accolades for his emotional portrayal in #October and now the actor has just confirmed that he is going to be Uncle! 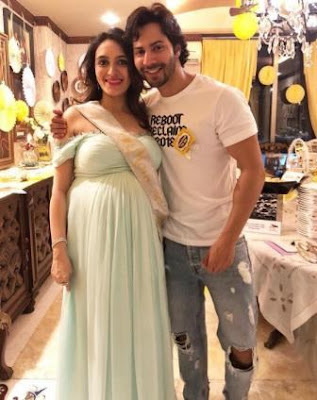 Varun Dhawan’s brother director Rohit Dhawan and Jaanvi Desai are expecting their first child and “Judwaa 2” took to his Instagram to share a picture with his Bhabhi. Varun shared the picture with smileys of “heart” and “child”! The actor will soon be an Uncle and David Dhawan will become a grandfather. Exciting times for “Dhawan” clan! Rohit Dhawan and Varun Dhawan have worked in the super hit movie “Dishoom” – which also starred John Abraham in the lead. Varun Dhawan is currently basking in the glory of October, which also starred debutante Banita Sandhu in Shoojit Sircar directorial story about love. Next Varun will be seen in Sui Dhaaga opposite Anushka Sharma, the upcoming film is directed by Sharat Katariya and produced by Maneesh Sharma under the banner of Yash Raj Films. Anushka Sharma essays the role of an embroiderer and Varun Dhawa plays a tailor. The well-crafted look of the two actors is setting the tone of the film right which promotes the campaign of Make In India. The film is scheduled for release on 28 September 2018.